Making a pond and garden more child proof. In the first two situations you can stretch and lay a netting across the water surface. The view on pond and fish will hardly be obstructed this way. By stretching and laying a netting across the water surface you will prevent blown in leaves from sinking to the pond bottom and disturbing pond environment. Leaves and other course dirt can be simply removed then. Thanks to a pond cover herons can no longer approach fish and they will leave again. 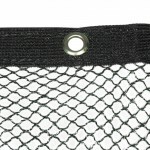 Pond covers are available in various sizes so that there will be a suitable net.